Every child deserves to receive a quality education. Education is a fundamental human right and a social good. But, the overwhelming majority of disabled children in Africa are being deprived of access to it. To quote one estimate, only around 2% of disabled children across the continent are attending school. Quite clearly this isn’t good enough and it must change. So what is the solution? Send all disabled children to school. It can’t be so hard, can it? This is essentially the essence of many education policies declared by African governments that have signed the United Nation’s convention on disability rights. The Kenyan government, for example, is committed to the full inclusion of all disabled children in mainstream education. The problem is that, at present, such policies basically amount to little more than unachievable, empty promises. Full inclusion of disabled children in mainstream education might sound good, and such a position is better than not having a policy at all. But it only takes a small amount of unpacking to realise that this noble declaration isn’t all that it seems. It only really represents an admission that the resources, or perhaps the political will, to deliver an education system which affords every individual the most appropriate educational experience does not really exist. The decision to put all children in one school is frequently an economic consideration rather than one based on sound educational theory. Such policies will fail to address the issue of disability holistically and they don’t encourage innovative thinking about solutions to the problem. If we want to enhance the life-chances of disabled children and young people, we need to look more closely at the reasons why they are prevented from accessing education. The obvious place to look is in the school itself. Clearly, many mainstream primary schools in Africa lack some key materials and resources which would make the inclusion of disabled children easier. Teachers, often with classes of more than fifty, generally lack the training and skills to meaningfully include disabled children in their lessons. With underfunded and inaccessible (or virtually invisible) systems for the assessment of children with impairments, vital information and advice is not passed on to school staff. Perhaps, above all though it is attitudes of non-disabled staff and students that present the greatest barrier to disabled children’s inclusion. A poor understanding of a child’s impairment, combined with stigma, can lead to a lack of recognition of their educational capabilities and the, sometimes quite simple, inclusive accommodations that need to be made. At worst, such attitudes could manifest as active hostility to the idea of inclusion in education – disabled children can find themselves effectively dismissed by school staff as ‘somebody else’s problem’. But we also need to look beyond the school. Disabled children are often actively prevented from accessing education by the attitudes and the decisions of their families. Primary education in most African countries is declared to be free and universal, but the extent to which this is really true varies hugely from place to place. Many would argue that ‘free’ education remains but a dream. The costs of the necessary uniforms and books to enable a child to attend school can represent a significant investment for the poorest families. The costs of attending school can be even greater for the families of disabled children, for example for transport, assessments or mobility aids. Add to this a lack of understanding of children’s educational potential and a range of negative superstitions surrounding disability, and many families decide that a disabled child is not worth the investment of limited resources. This is particularly true if she is a girl. Disabled children can also find school curricula to be largely inappropriate for their needs. In Kenya, impressive progress has been made towards the goal of full primary school enrolment. However, provision of secondary school places has not received the same attention or expanded at anything like the same rate. This has created a bottleneck effect, with the later years of primary school becoming increasingly exam-focused, as competition for the limited number of secondary school places intensifies. A child with profound intellectual impairments enrolled in a mainstream class can expect to sit these same exams – this is not only inappropriate it is unnecessary and cruel. This is a classic example of what is essentially a mainstream development success leaving behind a marginalised or vulnerable group, in this case disabled children. Furthermore, Kenyan secondary education is not ‘free’, as primary education theoretically is, and schools are more dispersed, making access for disabled children very difficult, even if they could get the required grades. 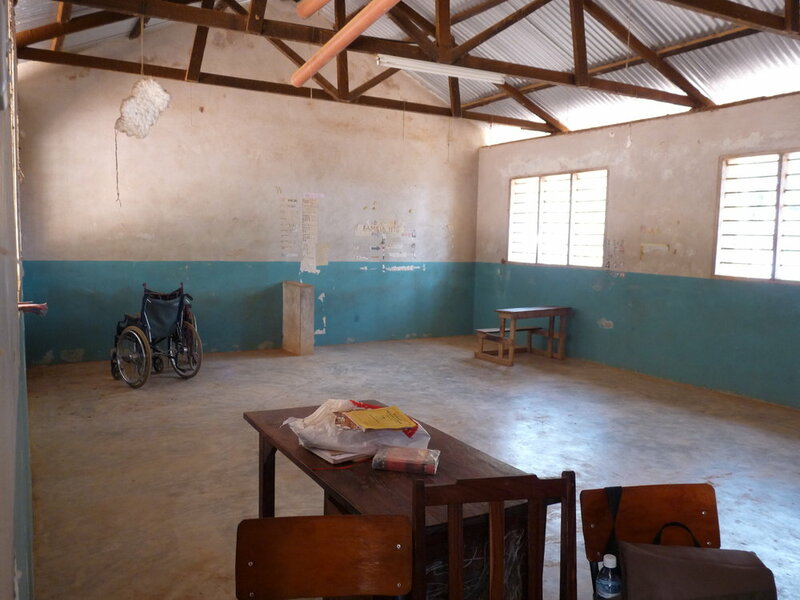 Drop-out rates for disabled children in Kenya who do attend school are extremely high, and attendance rates are low, due to the multiple barriers faced. Primary schools stand out in poor rural areas of Africa. Often, they are sturdy concrete complexes which contrast with the predominantly adobe-built housing that surround them. Some of the few places where significant amounts of public resources have actually been invested. The contrast between the classroom and the community outside is not just physical, it is social too. From The Gambia in West Africa to Kenya in the East we hear that for all of the progress that disabled children make in school, so much is undone at home. We hear that the safe school environment is not matched by a similarly secure outside community – the fact is that disabled children are frequently at genuine risk of abuse. Teachers worry what will become of children once they leave primary school. Frequently, the solution these well-meaning people offer is the construction of boarding house facilities. Our position on the institutionalisation of disabled children is clear – removing children from their families and isolating them from their communities does not address the problems that prevent their inclusion in society. All of these issues should prompt us to go beyond the realm of the teacher and the classroom in our search for solutions which address the real causes of discrimination and abuse. The government in Kenya, working in collaboration with the likes of UK-DfID and US-AID, is beginning to deliver ambitious centralised initiatives which attempt to tackle the problems of skills shortages amongst teachers. Programmes are underway to increase the numbers of teachers trained in ‘Special Educational Needs’ (SEN) and alternative communication methods. Incentive stipends are also being paid to teachers that work in the ‘SEN’ schools. Such actions are essential and should be welcomed. However, it will take a generation or more for the results to truly materialise. What can be done for disabled children now? What’s more, the sole focus on teacher training is narrow. These initiatives need to be matched and complemented by community-based programmes that aim to deliver sustainable social change, as well as more innovative approaches to inclusive education. It needs to be recognised that learning takes place outside of formal schools too, or at least, it should – the definition of what ‘education’ is, should be broadened. Our inclusive education programmes aim to improve the participation of disabled children in mainstream education, by addressing the barriers that prevent their attendance and obstruct learning. Our approach is holistic. We deliver a wide variety of activities which seek to challenge and change negative attitudes to disability in the community. Our programmes also attempt to cut across dividing lines between the spheres of ‘education’ and ‘social care’ – forging strong links between the school and the community outside to ensure that inclusion does not end at the end of the school day. Perhaps most importantly, we recognise that simply getting a disabled child into a classroom doesn’t equate to their full inclusion and as such is not the ‘be all and end all’. Our approach is not so much concerned with statistics and a dogmatic insistence that an arbitrary number of disabled children must be immediately enrolled in formal academic education. Rather it is child-centred and looks to focus of the needs of the individual and ensure that every disabled child that comes into contact with our projects is assisted to access the best and most appropriate educational experience for them. In the context discussed here we often find that playschemes are a vital component in this approach. A playscheme: the perfect place for disabled children to develop and learn! Playschemes, delivered with minimal resources by volunteers who need relatively little training, can be the best and most appropriate educational environment for a disabled child, particularly if that child has been isolated at home and deprived of essential stimulus and interaction. A playscheme provides opportunities to learn and develop important communication techniques and social skills. It is an important transitional bridge between isolation at home and eventual full participation in mainstream school. It also provides a useful context for assessment. Young volunteers can make the transition from playworker to classroom assistant supporting and advocating for the disabled child in the learning environment. Playschemes also provide parents with an opportunity to change their expectations of their disabled children and understand the value of education and inclusion. Anyone who wishes to shun the idea that play ought to have a huge role in education in Africa needs to look no further than UK play-groups to realise their hypocrisy. Early years curricula in primary schools are also, to some extent, play-based – although probably not enough. In Finland, children do not receive formal instruction in mathematics, reading and writing until the age of seven. Education in the preceding years focuses on socialisation, communication and physical activity to promote the health and wellbeing of every child. This is delivered through play, which is predominantly child-led and minimally structured. It has been recognised that the imposition of a rigid educational programme can impede the natural benefits of playing. Engaging in a task that they enjoy and ‘playing things through’ helps children to develop important qualities for learning, such as perseverance, imagination, concentration and problem-solving skills. Due to Finland’s movement away from a narrow, academic-focused understanding of education, its children are unsurprisingly happier and less stressed. This approach is succeeding by traditional academic attainment measures too – Finland has recently been adjudged to the world’s most literate country. Once children do reach the classroom, we believe that inclusive education programmes there need to focus on more than just the qualifications of the teacher and the resources that are available. What about the non-disabled children who are there already? Surely they have a large role to play in the creation of an inclusive educational environment. In The Gambia, West Africa we are piloting an innovative ‘child-to-child’ approach - ‘inclusion clubs’. The aim is to educate non-disabled students in disability awareness and ‘inclusive thinking’ and inspire non-disabled students to locate their absent and isolated disabled peers as a first stage to bringing them into the classroom. The idea is that children’s natural inquisitiveness, absence of deeply engrained prejudice and unrivalled access to and knowledge of their communities qualifies them perfectly to identify isolated disabled children through village surveys conducted as a school project. Non-disabled inclusion club members become responsible for supporting their disabled peers in the classroom. By taking the necessary steps to achieve a meaningful inclusive educational environment for disabled children, many of the steps will have been taken to include any child that is suffering from exclusion, whether it be on the basis of their gender, ethnicity, religion etc. Inclusion stands to benefit everyone, and there is evidence that it also improves learning outcomes for non-disabled children. When we attempt to ensure that all children are having their right to a quality education realised, we should adopt a broad focus. We must recognise that there are many interconnected reasons why disabled children face exclusion from education – they are both physical and social and go beyond the schools alone. Our approach attempts to address these issues holistically and gives due consideration to the reality that one size never fits all. The attendance of disabled children in mainstream schools is one part of a process by which all children can access the best and most appropriate educational experience, but it is not an end in itself. A child-centred approach which is serious about its impact will realise that community-based education is also essential to providing for the individual needs of disabled children now, and breaking down social barriers to the life chances of disabled children in the future. Older PostThe other inauguration: a new, inclusive Gambia?